This study aimed to evaluate the clinical significance of Vacuum Sealing Drainage (VSD) therapy in oral and maxillofacial surgery patients with serious maxillofacial abscesses, trauma wounds, or flap necrosis, and to summarize the advantages of VSD. We retrospectively analysed 28 patients who received VSD therapy in our ward since 2013, including 13 patients with trauma wounds, 8 patients with abscesses, and 7 patients suffering from postoperative flap necrosis. We then compared their treatment time and pain scores with those of 22 patients who received traditional therapy. All the data were statistically analysed using SPSS software. The VSD device was safe, and the 28 serious wounds were effectively resolved after VSD therapy. The use of VSD significantly shortened the time required for healing by 54.5% (P<0.01) and reduced the pain scores by 48.8% (P<0.01) as compared to traditional treatment. VSD has more advantages than traditional therapy in the treatment of various serious maxillofacial wounds, and leads to greater patient satisfaction. VSD has many useful applications in oral and maxillofacial clinical practice. Vacuum sealing drainage, Flap necrosis, Trauma, Maxillofacial abscess. Previously, treatment of some types of wounds, including traumatic wounds involving soft tissue defects, skin flap necrosis after reconstructive surgery, and serious abscesses, pose very challenging situations for oral and maxillofacial surgeons. The treatment protocol for these wounds involves meticulous surgical debridement and early definitive reconstruction, as necessary . The importance of sufficient debridement and treatment protocols have been documented previously [2,3]. In our experience, the patient’s suffering is increased when aggressive surgical debridement is required. Thus, surgeons face the dilemma of achieving a balance between effective wound treatments and reducing patient pain. The understanding of wound healing has advanced in the past 20 years, with the development of new techniques to manipulate the wound healing process and to improve healing rates, but many of these are costly and are not likely to be available for clinical use . Here, we introduce a type of technology that may be able to solve this problem. Vacuum Sealing Drainage (VSD) is a type of negative-pressure wound therapy that treats the wound and removes excessive exudate. VSD was first described by Fleischmann et al. in Germany in 1992, when it was applied to the treatment of soft tissue infections of the extremities, and was later introduced to China by Qiu and Song  in1994. Currently, VSD is widely used by orthopedic trauma surgeons for controlling wound infection, stimulating the granulation process, promoting wound healing, decreasing complications, and accelerating functional recovery. Concurrently, VSD is thought to reduce the pain and lead to greater patient satisfaction. It is worth mentioning that VSD played an important role after the Sichuan earthquake in 2008, when more than 150 severely injured patients were treated using this approach, with good results . Although VSD has been widely used for complicated wounds, its application in oral and maxillofacial surgery has rarely been described . Wound healing is particularly challenging after high-energy trauma to maxillofacial soft tissue, serious maxillofacial abscesses, and reconstructive flap necrosis. Here, we describe our clinical experience and success with using VSD in 28 patients with complicated maxillofacial wounds and infections. We have treated 3 groups of patients (18 males and 10 females, aged from 34 to75 y) with complicated wounds with VSD in the oral and maxillofacial ward of the First Affiliated Hospital of the College of Medicine, Zhejiang University, China, from 2013. VSD devices were supplied by Wuhan VSD Medical Science and Technology Co. Ltd, Wuhan, China (Figure 1). 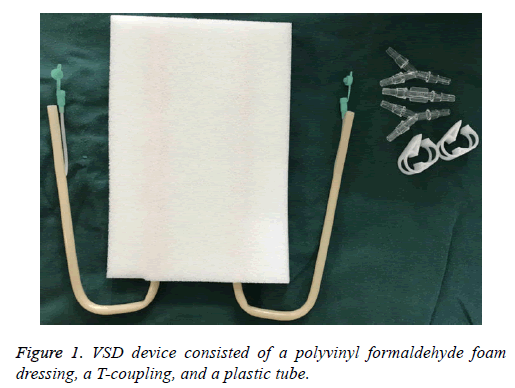 Figure 1: VSD device consisted of a polyvinyl formaldehyde foam dressing, a T-coupling, and a plastic tube. These devices consisted of a polyvinyl formaldehyde foam dressing, a T-coupling, and a plastic tube. The semipermeable membrane was supplied by UK Smith and Nephew Medical Ltd, London, UK. One end of the tube was connected to the foam and the other was connected to the central subatmospheric control unit. This study was conducted in accordance with the declaration of Helsinki. This study was conducted with approval from the Ethics Committee of Zhejiang University. Written informed consent was obtained from all participants. A total of thirteen traumatic patients, 3 patients injured by falling, 9 patients by crashing and 1 patient by blasting, had severe wound contamination and damage to facial soft tissue defects. Seven patients had combined open fractures. We first dealt with life-threatening injuries; we then performed surgery on the open fractures and thorough debridement to remove contaminants and dead tissues. The wounds were covered with VSD and closed with the semipermeable membrane. During the suctioning period, which was maintained for 3-7 d, no dressing changes were needed. After the VSD was removed, we repaired soft tissue defects with skin grafts or skin flap transplantations. 8 patients, with severe maxillofacial abscesses, underwent incision and drainage under local anesthesia, followed by placement of the foam into the abscess. 7 of them were odontogenic infections, and simultaneously had diabetes and poor glycemic control. Only one patient was infected with closed trauma of soft tissue. Finally, the wound was sealed with the semipermeable membrane. Negative pressure was controlled at 125 mmHg, continuously. The VSD was removed or replaced after 8-19 d, or when the drainage fluid was scant and clear. Reconstructed was performed immediately after maxillofacial malignant tumor resection, using skin flap for repair, in 7 patients, but the 7 flaps were partially or totally necrosis because of 3 patients of infection and 4 patients of vascular crisis. Finally, 7 patients had complicated wounds with partial or total loss of the flap. Additionally, we used the VSD system after surgical debridement, and complete wound healing was achieved in all 7 patients. We retrospectively analysed all 28 patients treated using the VSD treatment in our ward and compared their pain scores and treatment time with those of 22 patients who received traditional therapy. We used SPSS software to compare the datasets. There were statistically significant differences in treatment time and pain scores between the two groups (P<0.01). The average duration of VSD was 12.25 d. Traumatic wound treatment time was the shortest (7 to 9 d), while abscesses required the longest treatment time (8 to 19 d). However, the traditional treatment group required an average of 27.25 d. VSD also markedly reduced the pain scores during the patients’ hospitalization. Follow-up ranged from 3 to 6 months, and the final results demonstrated complete healing in all 28 patients studied. After using VSD for 1 w, in the 8 cases with abscesses, swelling was significantly decreased, without any allergic reactions. Using Computed Tomography (CT) examination, we found that effective control was gained over the severe abscesses and the dead cavity was reduced. In the 13 cases with extensive soft-tissue defects, fresh granulation tissue grew well, which provided an excellent soft-tissue bed for flap transplantation. In the 7 cases with flap necrosis, granulation was flat and fresh. Below we demonstrate the different groups by means of typical cases. Patient 1: This case was a 53 y old patient who had zygomatic bone and nasal bone fractures with peri-orbit soft tissue defect (Figure 2A), because of a traffic accident 6 days previously. The wound showed more inflammatory granulation tissue and exudate; we therefore performed debridement and placed the VSD. After 7 d, we removed the VSD (Figure 2B) and completed the skin graft simultaneously (Figure 2C). Figure 2: A: Patient with peri-orbit soft tissue defect; B: The wound has fresh granulation after VSD treatment; C: After removing VSD, patient with skin graft surgery immediately. Patient 2: This patient was a 66 y old diabetic male who suffered a carcinoma of the root of the tongue carcinoma. We performed a neck dissection and used a forearm flap for reconstruction, but unfortunately, the patient developed severe infection and flap necrosis (Figure 3A). After using VSD treatment for 12 d, the infection was controlled effectively (Figure 3B). Figure 3: A: Serious infection and flap necrosis; B: The infection was controlled after 12 d of VSD and there was a plenty of fresh granulation tissue. Patient 3: This patient was a 42 y old male that presented with a serious maxillofacial abscess after 9 d of toothache (Figure 4A). Traditional drainage and anti-inflammatory therapy did not have a good result; we switched to VSD, which was placed into the pus cavity. After 6 d of VSD drainage, we observed a change in the abscess through CT examination. The pus cavity was markedly reduced (Figure 4B). 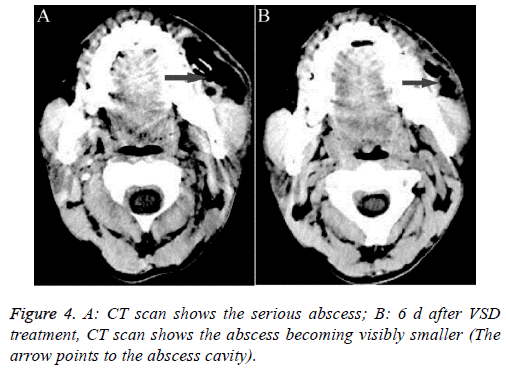 Figure 4: A: CT scan shows the serious abscess; B: 6 d after VSD treatment, CT scan shows the abscess becoming visibly smaller (The arrow points to the abscess cavity). VSD has been in use since the 1990s. It is a type of Negative Pressure Wound Therapy (NPWT) and is commonly referred to as Vacuum-Assisted Closure (VAC) in North America. Numerous basic research and clinical studies have verified that VSD not only results in complete drainage, but also eliminates dead space and stimulates the growth of healthy granulation tissue . In the field of oral and maxillofacial surgery, VSD has not been widely applied, and is rarely used in the treatment of postoperative fistulas and exposed wounds resulting from head and neck reconstructive surgery . We therefore studied the scope of application of VSD in clinical practice. Wound healing is particularly challenging after high-energy trauma to the maxillofacial soft tissue. Maxillofacial surgeons need to close the wound and restore the patient’s appearance and function as soon as possible. A free-flap is the optimal treatment approach for repairing soft tissue defects after debridement. The basic surgical principle used in the management of traumatic wounds is debridement. Incomplete debridement is detrimental to tissue healing . Necrosis or pollution of severe wounds with soft tissue defects would lead to further infection and difficulty in immediate repair of a defect. Trials in animals demonstrated that VSD could improve bacterial clearance . Additionally, a prospective clinical study has demonstrated that VSD can accelerate drainage and decrease the rate of infection, as compared with a pressure dressing . Therefore, the application of VSD can shorten the waiting time for a second operation and can improve the survival rate of a skin flap. Severe maxillofacial abscesses represent a potentially lifethreatening clinical condition, of which the most serious complications are respiratory obstruction and septic shock. The mortality is very high, reaching 40%-50%, if the infection spreads from the deep neck region to the mediastinum . The main types of severe maxillofacial abscesses are postoperative, odontogenic, and traumatic. In patients with large maxillofacial abscesses, traditional therapy consists of incision and drainage, followed by twice-daily dressing and debridement. The treatment cycle in traditional therapy is long and the drainage effect is not exact. In contrast, the removal of exudates from abscesses by NPWT has been well described in the literature . Moreover, in clinical practice, the tissue granulation promoted by VAC allows improved closure of the subcutaneous layers as compared to when using a conventional method . In our 8 cases with severe abscesses, we show that VSD can markedly accelerate the decrease in the pus cavity by promoting thorough drainage. Common incisional closure complications in oral and maxillofacial surgery include postoperative wound infection, dehiscence, formation of hematomas, and skin flap necrosis, all of which lead to delayed healing of the incision. Among them, the treatment of skin flap necrosis is the most difficult, and a second skin flap surgery may be required. Additionally, wounds that fail to heal may cause considerable distress to patients and impact negatively on their physical, emotional, and economic states. Kakarala used a VAC dressing that could be placed directly over the free muscle flap to assist in the in the closure of cutaneous defects . In our case, we applied the VSD directly to the exposed cutaneous defect to create a uniform bed of granulation tissue within 8 to 12 d and to decrease the reconstruction rate in the oral and maxillofacial region further. For maxillofacial surgeons and patients with complex wounds, decreasing the pain and shortening the treatment course are significant issues. In the past, physicians have treated these patients with debridement and dressing changes, which were painful and achieved slow healing. Furthermore, traditional therapy has the potential of injuring nerves, joints, and arteries . Other scholars have also confirmed that application of VSD results in faster wound healing, decreased hospitalization time, improved patient comfort, and decreased workload for the medical team, as compared to traditional therapy [14,15]. In our study, we compared 28 patients treated with VSD with 22 patients who received traditional therapy for severe infections, and the benefit of VSD was marked (Table 1). Note: NRS: Numerical Rating Scale, 0-10 represents different degrees of pain. This is the most commonly used method of pain scoring. Table 1. Comparison of pain score and treatment time between the two groups. In 2010, Borgquist et al. compared the effect of negative pressures, ranging from 10 to 175 mmHg, on microvascular blood flow . They found that the optimal negative pressure for wound healing was 80 or 125 mmHg. Another review by Moues et al. found that negative pressure of 125 mmHg seemed to be optimal, increasing the blood flow four-fold. These reports all considered that excessive negative pressure could adversely affect wound healing by creating ischemic changes. However, some of the literature reviewed defined negative pressure as 150 or 175 mmHg. Thus, there may be some discrepancy in the definition of optimal negative pressure. In our study, we set negative pressure to 125 mmHg and universally achieved favorable patient outcomes. VSD devices are changed every 7-10 d, as compared with 2 or 3 times daily for traditional dressings. Although the VSD devices are more expensive than traditional dressings, cost savings are achieved by decreased wound care labor, the need for shorter courses of antibiotics, and shorter hospitalization times. It should be noted that patients are routinely treated with prophylactic antibiotics for a 3 or 5 d course after implementing VSD. It is important to maintain VSD for a week or more in order to treat infection . Traditional treatments required longer courses of antibiotics, contributing to a higher cost of treatment. It is important that negative suction be maintained with an airtight seal. In order to accomplish this, before the wound is sealed by the semipermeable membrane, any facial hair must be clipped and the skin must be cleaned. If the patient has a fistula on the oral mucosal surface, it should be sutured or plugged. In conclusion, VSD can accelerate the growth of granulation tissue and reduce both patient discomfort and physician workload. Based on our study and review of the literature, VSD is an effective new treatment for serious maxillofacial infections and abscesses and should be widely utilized. This work is supported by the grant from Traditional Chinese Medicine Science and Technology Plan of Zhejiang Province (No.2014ZB061) and Medical Science and Technology Project of Zhejiang Province (No.2015KYB160) in the study design and the collection. Fleischmann W, Becker U, Bischoff M, Hoekstra H. Vacuum sealing: indication, technique, and results. Eur J Orthop Surg Traumatol 1995; 5: 37-40. Qiu HD, Song JH. Vacuum sealing drainage. Peoples Med Publ House Beijing 2008. Liu L, Tan G, Luan FJ, Tang X, Kang P, Tu C, Pei F. The use of external fixation combined with vacuum sealing drainage to treat open comminuted fractures of tibia in the wenchuan earthquake. Int Orthop 2012; 36: 1441-1447. Yang YH, Jeng SF, Hsieh CH, Feng GM, Chen CC. Vacuum-assisted closure for complicated wounds in head and neck region after reconstruction. J Plast Reconstr Aesthet Surg 2013; 66: 209-216. Morykwas MJ, Argental LC, Shelton-Brown EI, McGuirt W. Vacuum-assisted closure: a new method for wound control and treatment: animal studies and basic foundation. Ann Plast Surg 1997; 38: 553-562. Rosenthal EL1, Blackwell KE, McGrew B, Carroll WR, Peters GE. Use of negative pressure dressings in head and neck reconstruction. Head Neck 2005; 27: 970-975. Tejwani NC, Webb LX, Harvey EJ, Wolinsky PR. Soft-tissue management after trauma: initial management and wound coverage. Instr Course Lect 2011; 60: 15-25. Stannard JP, Robinson JT, Anderson ER, McGwin G Jr, Volgas DA, Alonso JE. Negative pressure wound therapy to treat hematomas and surgical incisions following high-energy trauma. J Trauma 2006; 60: 1301-1306. Wang LF, Kuo WR, Tsai SM, Huang KJ. Characterizations of life-threatening deep cervical space infection: a review of one hundred ninety-six cases. Am J Otolaryngol 2003; 24: 111-117. Singhai P, Kejriwal N, Lin Z, Tsutsui R, Ullal R. Optimal surgical management of descending necrotizing mediastinitis: our experience and review of literature. Heart Lung Circ 2008; 17: 124-128. Gallo O, Deganello A, Meccariello G, Spina R, Peris A. Vacuum-assisted closure for managing neck abscesses involving the mediastinum. Laryngoscope 2012; 122: 785-788. Kakarala K, Richmon JD, Lin DT, Deschler DG. Vacuum-assisted closure in revision free flap reconstruction. Arch Otolaryngol Head Neck Surg 2011; 137: 622-624. Tang J, Guo WC, Yu L, Zhao SH. Clinical efficacy of artificial skin combined with vacuum sealing drainage in treating large-area skin defects. Chin J Traumatol 2010; 13: 289-292. Krug E, Berg L, Lee C, Hudson D, Birke-Sorensen H, Depoorter M, Dunn R, Jeffery S, Duteille F, Bruhin A, Caravaggi C, Chariker M, Dowsett C, Ferreira F, Martínez JM, Grudzien G, Ichioka S, Ingemansson R, Malmsjo M, Rome P, Vig S, Runkel N, Martin R, Smith J. Evidence-based recommendations for the use of negative pressure wound therapy in traumatic wounds and reconstructive surgery: steps towards an international consensus. Injury 2011; 42: 1-12. Gregor S, Maegele M, Sauerland S, Krahn JF, Peinemann F. Negative pressure wound therapy: a vacuum of evidence? Arch Surg 2008; 143: 189-196. Borgquist O, Ingemansson R, Malmsjö M. Wound edge microvascular blood flow during negative-pressure wound therapy: examining the effects of pressures from -10 to -175 mmHg. Plast Reconstr Surg 2010; 125: 502-509. Moues CM, Heule F, Hovius SE. A review of topical negative pressure therapy in wound healing: sufficient evidence? Am J Surg 2011; 201: 544-556. Zhang CQ, Zheng HY, Wang B, Huang H, He F, Zhao XL. Treatment of gustilo grade III leg fractures by external fixation associated with limited internal fixation. Chin J Traumatol 2010; 13: 96-100.